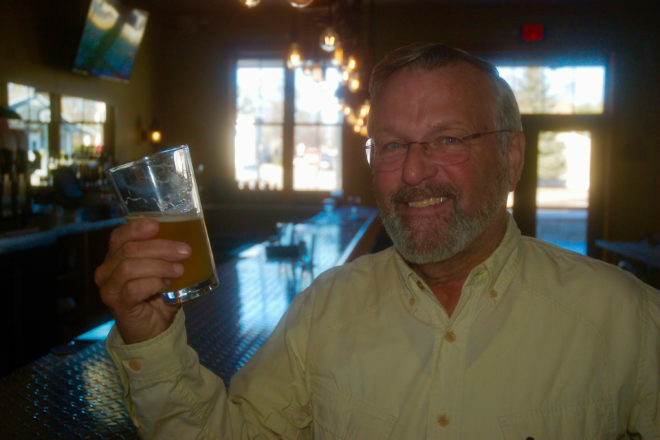 Paul Regnier enjoys a hazy East Coast IPA at Shipwrecked in Egg Harbor. Photo by Jim Lundstrom. Paul Regnier recalls the bad old days when macrobreweries produced nothing but homogeneous American lagers, yet people still had allegiance to a beer brand. For the record, he was a Pabst person. But the times, they were a changin’, and Regnier, who possesses an inquiring mind, had an idea that the world of beer was bigger than that. Like many, many others, he picked up a copy of nuclear engineer/homebrewer Charlie Papazian’s The Complete Joy of Homebrewing and threw himself into the art and science of making his own beer. This was while he was attending graduate school at the University of Wisconsin-Stevens Point. Once he had his technique down, Regnier held a homebrewing demonstration for fellow grad school students. In 1990 Regnier moved to Door County to serve as naturalist and executive director at the Ridges Sanctuary, bringing with him his newfound love for homebrewing and an innate desire to teach others. In 1993 he approached The Clearing Folk School in Ellison Bay about holding a homebrewing class. “I proposed it to The Clearing and they said, ‘We have winemaking classes. Let’s do it’,” he said. He had a good turnout for the series of four classes and quite a few of the students continued to make their own beer once the class ended. But brewing beer in a class is a lot of work. Regnier wanted to continue to slake the thirst for beer knowledge through The Clearing, but after two years of the homebrew class he wanted to change it up. Regnier presents about a half-dozen different examples of a style for blind tastings and self-scorings of the beers, followed by discussion of the characteristics that define the style. This year’s theme is India pale ales, a hop-heavy version of an English style known as pale ale. References to pale ale first appeared in London brewing records in the very early 1700s. A century later, in the early 1800s, specific hopping rates were named for pale ales being shipped to satisfy the thirst of British troops serving in India. Brewers increased the hops so the pale ale could survive the six-month voyage and the heat of that part of the world. That hopped-up version of pale ale was known first known as East India Pale Ale after the East India Company, whose ships delivered the beer and other goods because the company had the monopoly on trade in the region. By the 1840s, IPAs were being brewed for the British market, and today they are more ubiquitous than American macrolagers were before the craft beer evolution/revolution. Regnier has invited me and Main Street Market beer guru Sam Northrop to suggest our favorite IPAs to be included in the tasting. I know Sam’s a big IPA guy, but me, I prefer the British IPAs such as Worthington’s White Shield to just about any American IPA. So, we’ll see where that goes. Regnier said the whole idea behind the class is to get people thinking about what they are drinking. “An Afternoon of Ales” will be held 4:30-6:30 pm Jan. 10 at the Jens Jensen Visitor Center at The Clearing. The cost is $35. Sign up online at theclearing.org.